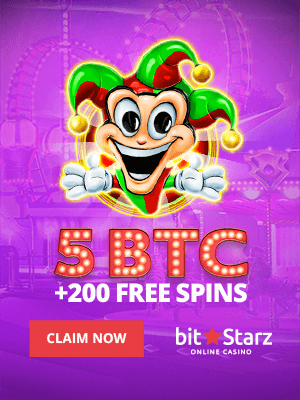 The crypto market might be concerned about the US government shutdown, hence the uncertainly and little movement whatsoever. With all top assets downtrending, the price is trying to reach the recent lows. The most discussed event was the Mt. Gox CEO selling a large number of bitcoins through BitPoint, which became a case for trials in the Tokyo court. In the meantime, Binance Coin market cap rose by 15% in a single day and went over $1B after the token sale at Launchpad was announced. MyEtherWallet was hacked through sending phishing emails to the users. On H4, the BTC is trying to stop trading sideways and break out the local lows. 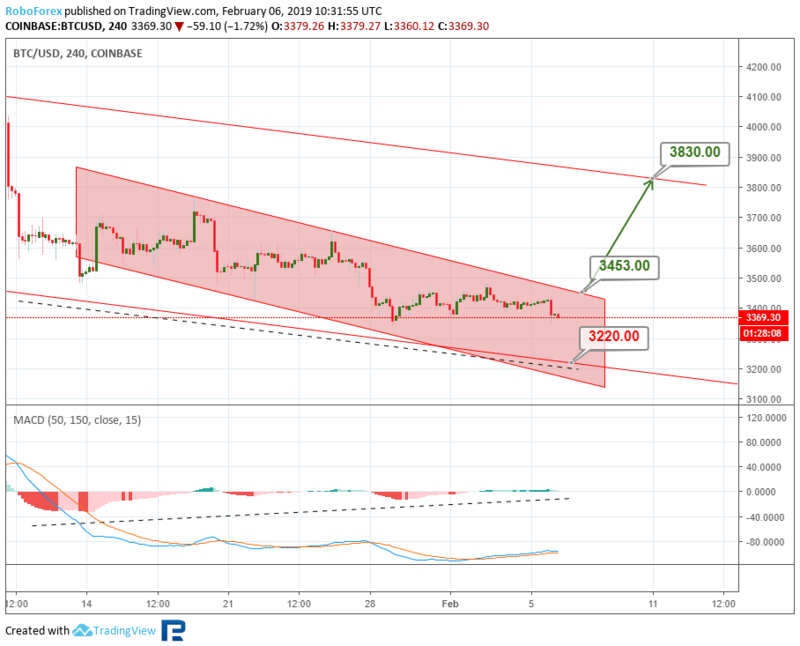 The current descending channel is headed to the long term channel support at $3,220. The MACD is meanwhile diverging, which may signal a pullback after the support has been hit. The target of such a pullback may lie at the short term descending channel resistance, or $3453.00. If this one gets broken out, the price may rise to the major channel resistance at $3830.00. On H1, the support breakout may be seen in detail. 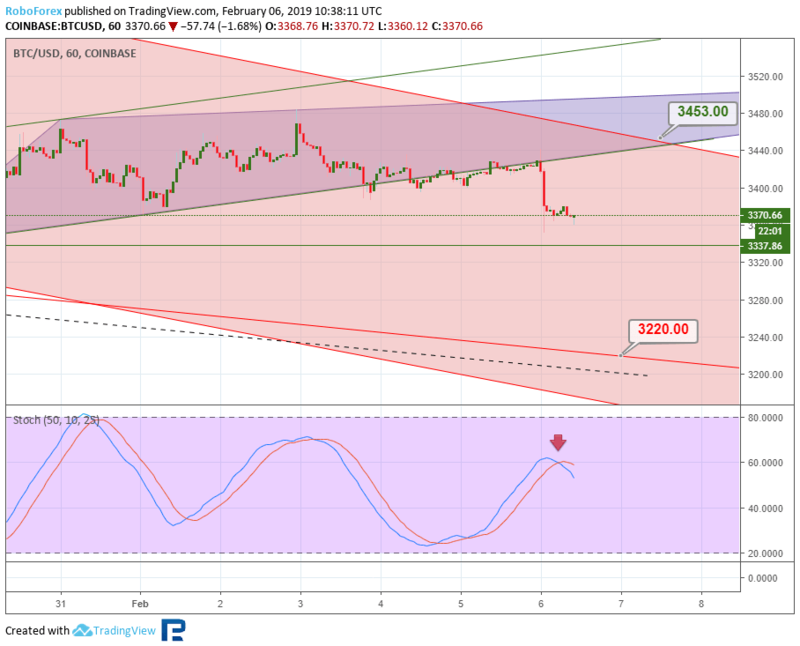 The Stochastic is forming a black cross, which may mean the price is ready to go further down, with its immediate target at $3,337. On H4, the TRX has formed a triangle, which signals a correction. 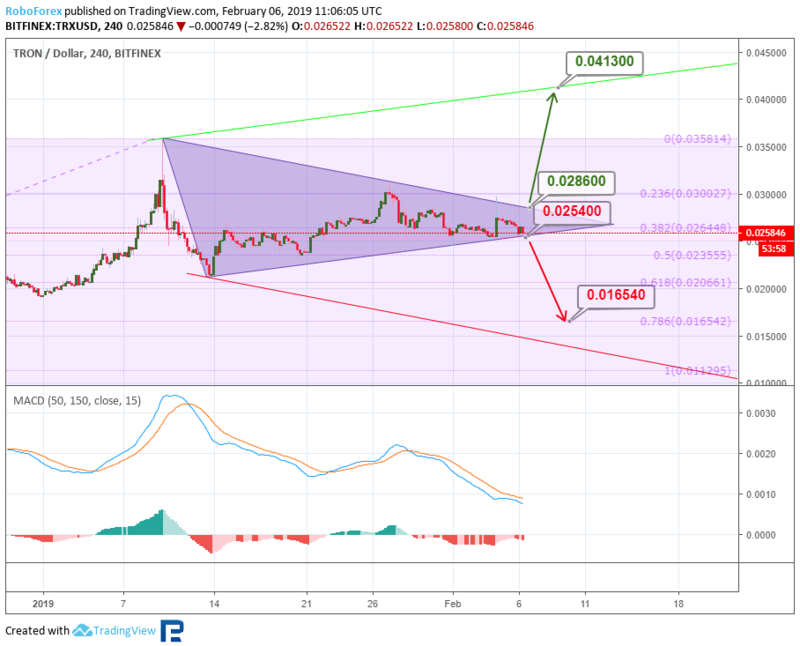 Most likely, the crypto will soon break out the lower support boundary at $0.254 and go down to 76% Fibo, or $0.0165, which is well confirmed by the MACD going down. 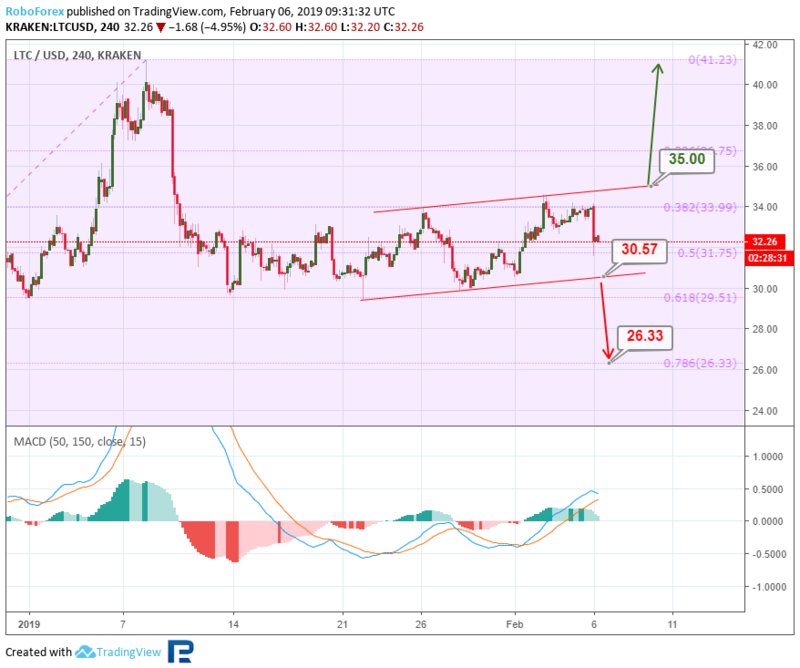 Conversely, the price may still break out the resistance at $0.0286, in which case the TRX will be able to abruptly go up to reach the resistance at $0.0413. On H1, the price is testing the triangle support, while the Stochastic is in the oversold territory. 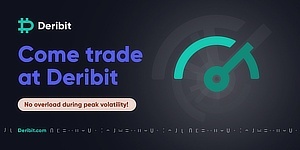 This all means the crypto may well bounce and reach the resistance at $0.0286. On H4, Ether is still going down steadily. The price broke out the low and is now headed towards 76% Fibo, or $98.30, which can happen very soon. 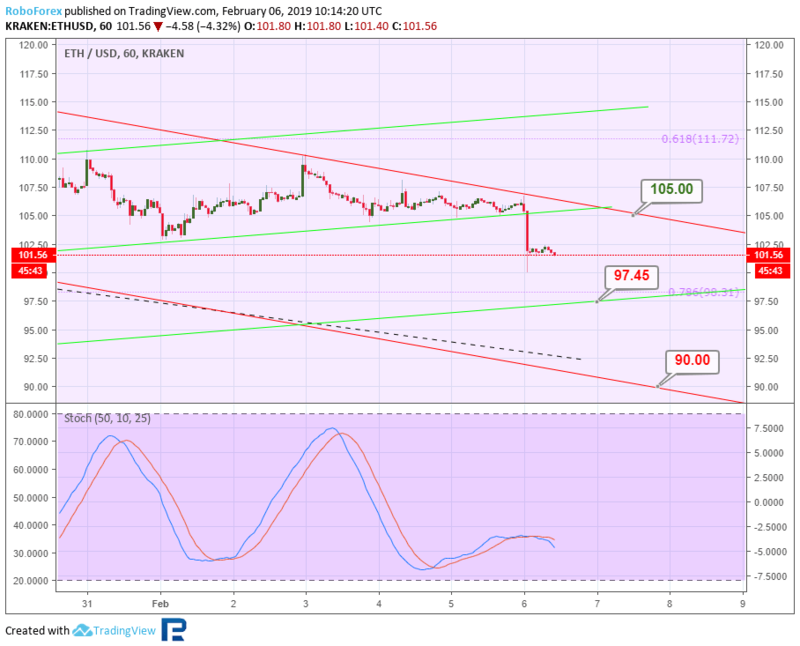 The price may even hit the channel support at $90. However, the MACD is converging, which may signal a correction is near. If this is the case, the price will first try to reach the resistance at $105. 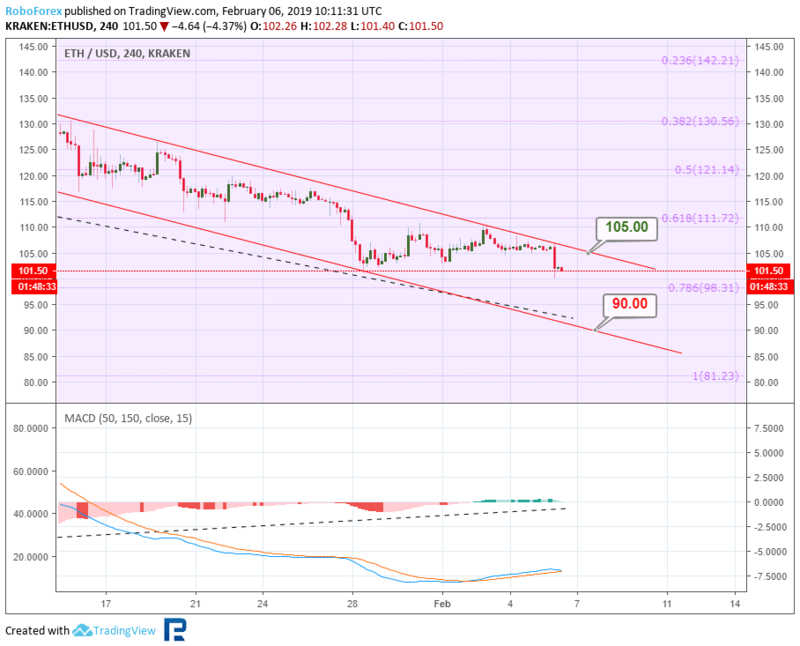 On H1, Ether broke out the local support and is now headed to the projection support at $97.45. The Stochastic’s black cross may mean the downtrend is likely to continue. On H4, the LTC is correcting locally, forming an ascending channel. The price bounced off the upper boundary and is now headed towards the support at $30.57. In case it manages to break it out, the downtrend will probably continue, with its major target at 76% Fibo, or $26.33, especially if a black cross is formed by the MACD. Conversely, if the resistance at $45 gets broken out, an uptrend may start forming. On H1, the price hit the projection channel support after the short term uptrend ended. 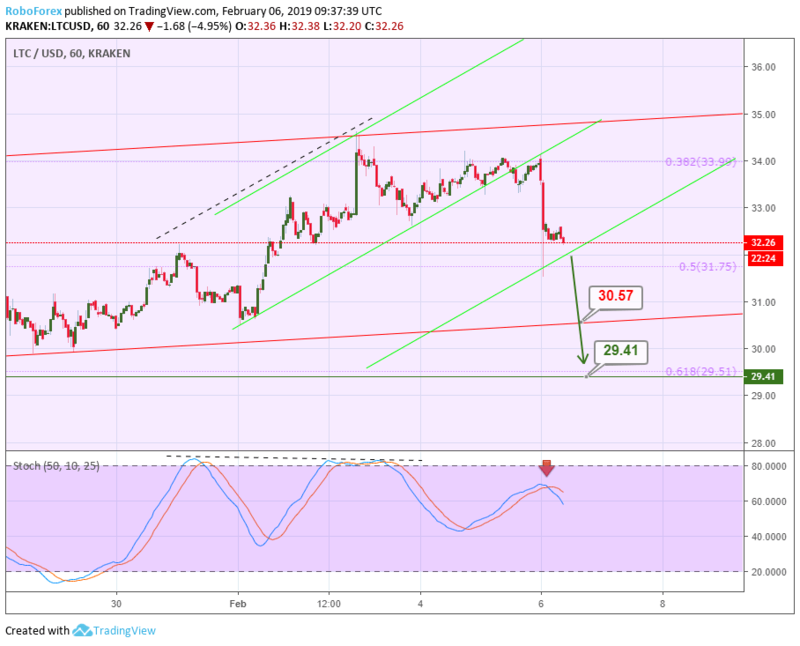 If this support gets broken out, the price may hit the important low of $29.41, which is confirmed with the Stochastic’s black cross. On H4, the XRP is forming a short term descending channel within the long term trend, also descending. 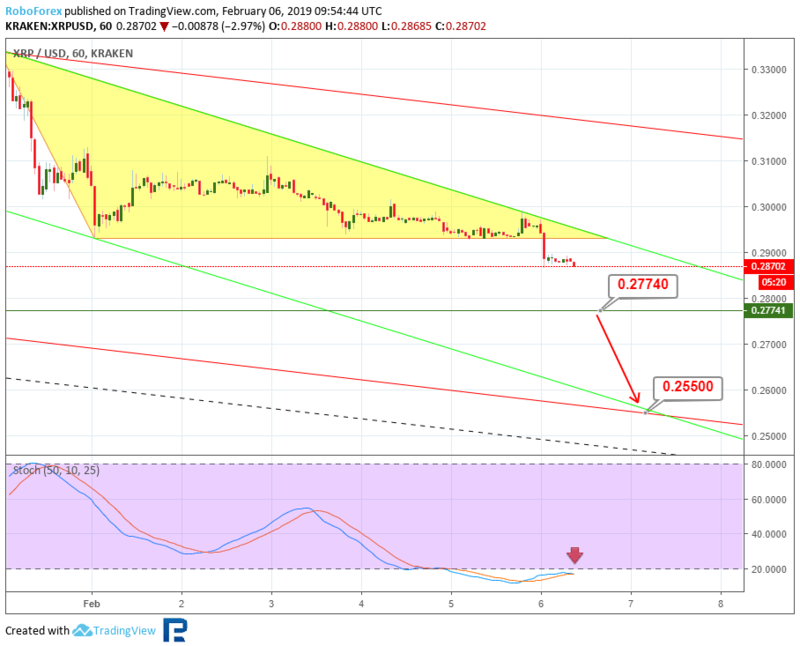 The price is currently headed to $0.2550, and once this one gets broken out, it may get further down to reach $0.1400, although this is not that likely in the short term. A bounce and a correction trend is what is far more likely, and it’s also confirmed by the MACD. 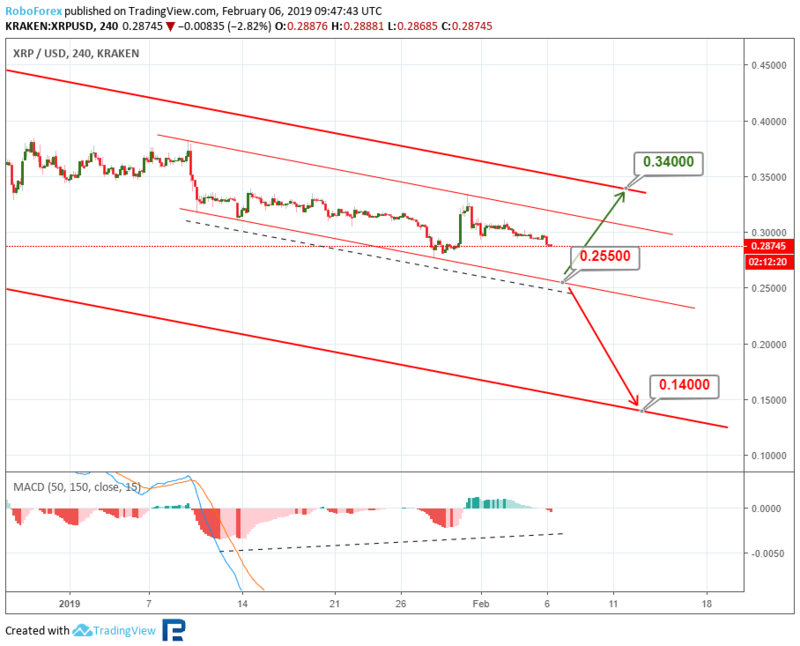 Such a trend may have the major resistance as its target, or $0.3400. 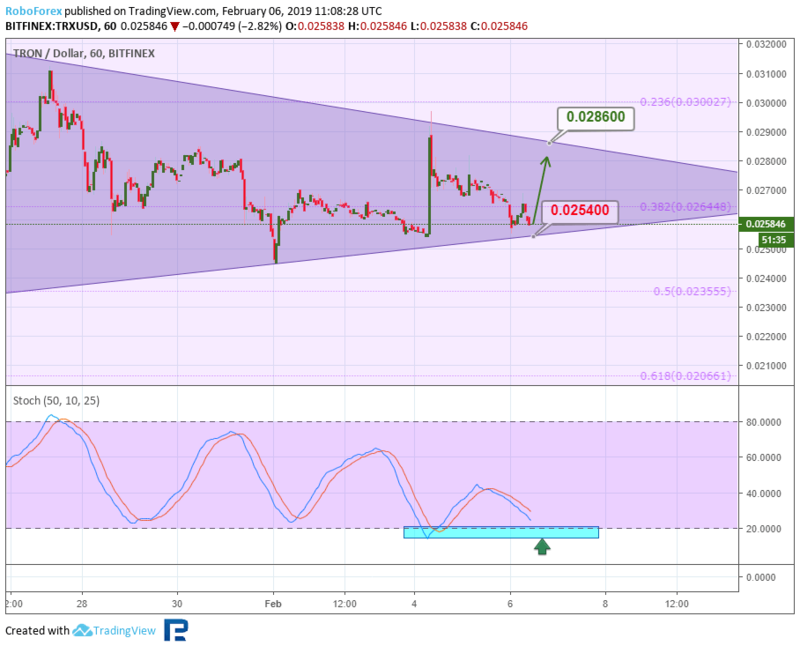 On H4, the XRP broke out the support and left the triangle, going down towards the low at $0.2774. The Stochastic formed a black cross, which confirms the bearish outlook.